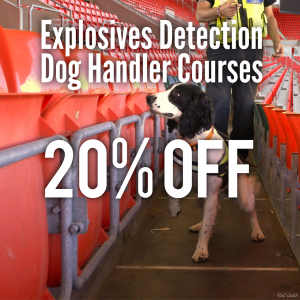 We’re offering 20% off our Explosives Detection Dog Handler Courses. Our sister company, Event Detection Dogs (EDD) provide explosives detection dogs and handlers to help ensure stadiums and arenas are safe and secure before, during and after an event. To celebrate the success of EDD we’re offering 20% OFF our Explosives Detection Dog Handler Courses. This reduces the cost down from £3995 to £3196 and applies to all course dates in 2019. This is an Enhanced Learning Credits (ELC) approved course for which service personnel (both serving and former) may be eligible for funding. Please visit the ELC website for more information on eligibility and funding. Our ELC provider number is 6931. For more information on this course and course dates please click here.